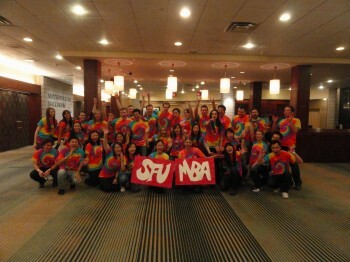 39 students from the MBA and MOT programs attended the MBA games in Toronto from January 7th to January 9th. ?Taralyn Day, Jeff Norman, Karen Robson and I were selected to take part in the marketing plan competition. 18 schools competed in the marketing plan competition. This event was sponsored by Telus, and the competitors were given three hours to create a marketing plan to position Telus as the leading retailer of tablets. Our day began at 9:30 with a kick-off session. We were given some background information about Telus, and what our assignment was. The teams were required to create a strategy that would position Telus as the leader in the mobile tablet industry. Thanks to Colleen Collins and Jeff Nehajowich both the marketing team and the case competition team (Colin Lam, Julia Green, Matt Harris, and Kelvin Chu) had the opportunity to do a practice case before travelling to the games. As a result, we started the competition with a PowerPoint template ready to go. The template saved us some valuable time. The team dove right into the analysis. Luckily, we are all tech savvy, and had a good understanding of the products in question. Our proposal for Telus is the “Service First Strategy”. We recommended that Telus position itself as the WestJet of the telecommunications industry. They need to emphasize their great customer service, and tell their customers that they have great customer service. We also analyzed and gave recommendations on their pricing, distribution and infrastructure strategy. After we submitted our slides, the team got down to work on perfecting our presentation skills. Luckily, Colleen Collins was with us, and she was able to give us great feedback on what we needed to focus on. All teams were invited to the Telus building at 25 York Street to give their presentations. The teams were divided in to four groups and the winner of each group would win a spot in the finals. Our team was presenting third in our group. This gave us some extra time to practice our presentation. When our turn came up, the four of us were confident and ready to go! The judges gave all the presenters some constructive feedback, and the winners were announced. The SFU team has made it to the finals!! The teams were required to present their slides again to a new group of judges. We were up against UBC, University of Alberta, and McGill. In the end, University of Alberta won the competition, and received new HTC Desire cell phones as their prize. The marketing competition was a great experience. I would recommend everyone to try to do a competition at least once. I learned the importance of being prepared, and how important time management is. These are skills that I will carry with me for the rest of my career.